Great Public Schools Now holds a news conference Thursday where it announced $4.5 million in initial grants. At center is GPSN Executive Director Myrna Castrejon. Newly established nonprofit Great Public Schools Now announced Thursday it has awarded $4.5 million in its initial grants to three organizations: Teach for America, a charter school and an after-school program. 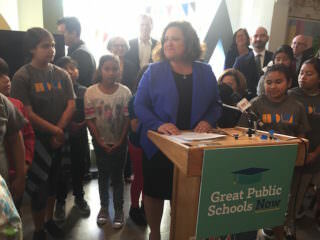 Great Public Schools Now unveiled its plan this week to increase access to high-performing schools in 10 neighborhoods where it says 160,000 low-income English language learners are enrolled in schools where 80 percent of students are learning below their grade level. About 50 students, parents, members of the media and people involved in the initiative attended a news conference announcing the grants at Heart of LA’s art gallery in Rampart/Westlake at the corner of Wilshire and Rampart boulevards, where student artwork was on display. Heart of LA is one of the grant recipients. The after-school program that offers arts, athletics and academic programming to about 2,300 youth ages 6 to 24 each year will receive $500,000 that will go toward its new educational arts and enrichment center, expanding the four-building campus to serve an additional 300 students, the large majority of whom live in poverty. • Read more on the plan and reaction, the 10 targeted neighborhoods and Myrna Castrejon on the path ahead. Equitas Academy, which runs three charter schools in the Pico-Union neighborhood of Los Angeles, will use its $2 million grant from GPSN toward its $11 million project to construct a new school building at 11th Street and Beacon Avenue. The new elementary school will serve 500 students and is expected to open in the fall of 2017. 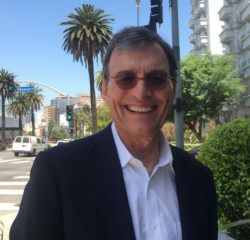 “Finding facilities in downtown Los Angeles is really, really a challenge for schools like ours, so it’s a big win for us,” said Jon Host, chief operating officer of Equitas. Host said 500 students are on the waitlist to enroll in the organization’s charter schools. The $2 million GPSN grant to Teach for America-Los Angeles will help the group expand the number of new teachers it recruits and trains. Executive Director Lida Jennings said LA Unified will hire up to 50 Teach for America teachers for the upcoming school year, potentially doubling the number the district hired the previous year. This fall’s class represents the group’s biggest cohort of new teachers since the Great Recession. GPSN’s new plan outlines its targeted areas of funding as teacher and leadership pipeline and support, facilities, community engagement and school replication. The cornerstone of the plan is to replicate high-performing schools in poor areas where there is a need for better schools, identified by GPSN as: Boyle Heights/East L.A., El Sereno, Pacoima, Panorama City, South Gate, South L.A., Vermont Slauson, Vermont Square, Watts-Westmont and Westlake-Pico-Union. But the organization has not yet chosen which schools will receive replication grants, which will provide startup funding for the schools for the first three to five years of the school’s existence, according to the plan. Castrejon said she will be working with Superintendent Michelle King this fall to determine how the organization will collaborate with the district to determine which high-performing district schools or programs will be replicated. She expects more grant funding to be announced in the fall. King’s chief of staff, Alma Sanchez, attended the news conference, along with the district’s communications director, Shannon Haber. GPSN Board Chairman Bill Siart said the “ideal scenario” would be if there is a magnet program within a district school that has extra space for the program to expand. Great Public Schools Now board chairman Bill Siart. Castrejon, who spoke in English and Spanish, said the initial grants are “early demonstrations” of the group’s mission. She reiterated the group will not be solely concentrated on charter schools, which was the focus of a draft plan published in the Los Angeles Times last year. “We want to help those school teams, directly those school leaders, directly those teachers to do more, whether they add seats, whether they open a second school, that’s exactly where we want to invest and support, regardless of whether they are charter schools or pilots or magnets or traditional district schools,” Castrejon said. 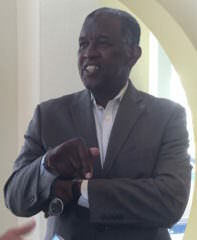 Board member Virgil Roberts, chairman of the board of Families in Schools and longtime education advocate in Los Angeles, addressed the criticisms from some since the plan was released that the group will continue to push a charter schools-only agenda. Great Public Schools Now board member Virgil Roberts. 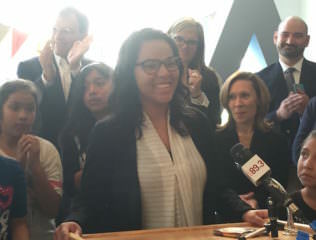 One student spoke during the event: Tatiana Romero, who graduated from Camino Nuevo Charter Academy and will attend USC in the fall to study architecture. “I was lucky enough to have a family that was committed to drive me one hour every day to go to my high school, but not every student has that opportunity,” Romero said. Tatiana Romero graduated from Camino Nuevo and will attend USC in the fall. GPSN also unveiled its six-figure advertising campaign that will include three television ads. Maria Silva, a mom of three, is featured in the ads and spoke at the news conference. The print advertising campaign focuses on ZIP codes: “When it comes to education 90210 should equal 9002.” The former ZIP code belongs to upscale Beverly Hills, which has its own school district, and the latter to the Florence-Firestone neighborhood of Los Angeles. *This article has been updated to note there will be three television spots in the ad campaign, to add a post-event comment from Castrejon about TFA support and to clarify that LA Unified will hire up to 50 TFA teachers for the coming year.